His Holiness Romapada Swami is a Vaishnava sannyasi, initiating guru and a governing body commissioner of the International Society for Krishna Consciousness. He was born on December 27, 1948 in Utica, New York, as the youngest of five children. During July of 1971,Srila Romapada Swami received first initiation from Srila Prabhupada at the temple located on Henry Street in Brooklyn, New York. One year later, during the summer of '72, Srila Romapada Swami received second initiation. At the time he was fully engaged as the Sankirtana Leader and the Temple Commander in a temple of 150 devotees. In the summer of 1982, Srila Romapada Swami received initiation into the renounced order of life. After accepting sannyasa, he traveled to many temples throughout the United States and Europe, preaching Krsna consciousness. 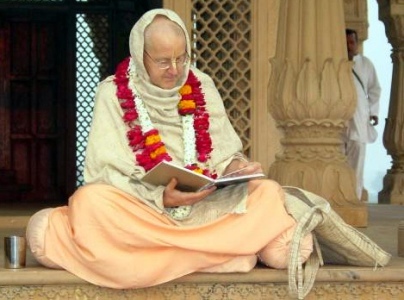 Yet he always maintained his base at Sri Sri Radha-Govinda Mandir in New York, and continued to orchestrate many local opportunities for college preaching, distributing prasadam and giving the message of Krsna consciousness to others. In March of '92, he was appointed Governing Body Commissioner for New York and New Jersey. In '94 he accepted the same responsibility for the Midwest United States. Under his inspiration and direction many Sunday Schools and congregational development programs have sprouted and flourished.